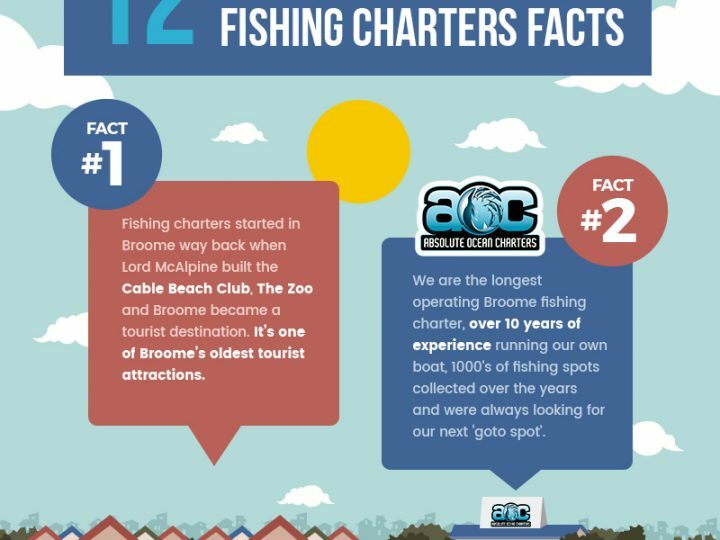 People love fishing in Broome and the Northern waters of Australia, the marine life is plentiful and there is a greater variety of species on offer compared to the waters in the south. 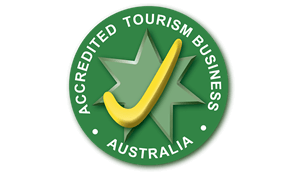 One of the sort after species when people come on our Fishing charter in Broome is the Coral Trout. The coral trout is a species of fish in the Serranidae family. Abundant in Broome if you know where to look, its natural habitat includes open seas and coral reefs. Coral trout are active hunters and fierce predators, juvenile trout mostly eat crustaceans, smaller fish and they love prawns. 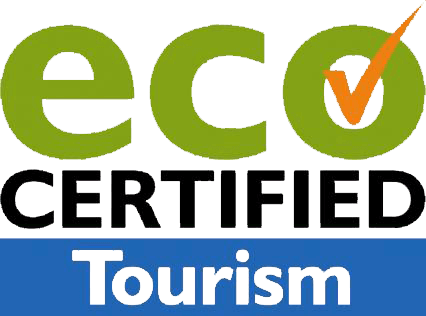 Adults feed upon a variety of reef fish, and we find all kinds of fish in the stomachs of coral trout. Sometimes the fish these guys eat are so big it makes you wonder how they got in there. Coral Trout are mostly territorial and they will usually pick a nice rocky out crop or bit or reef to take up residence where they can ambush smaller fish. 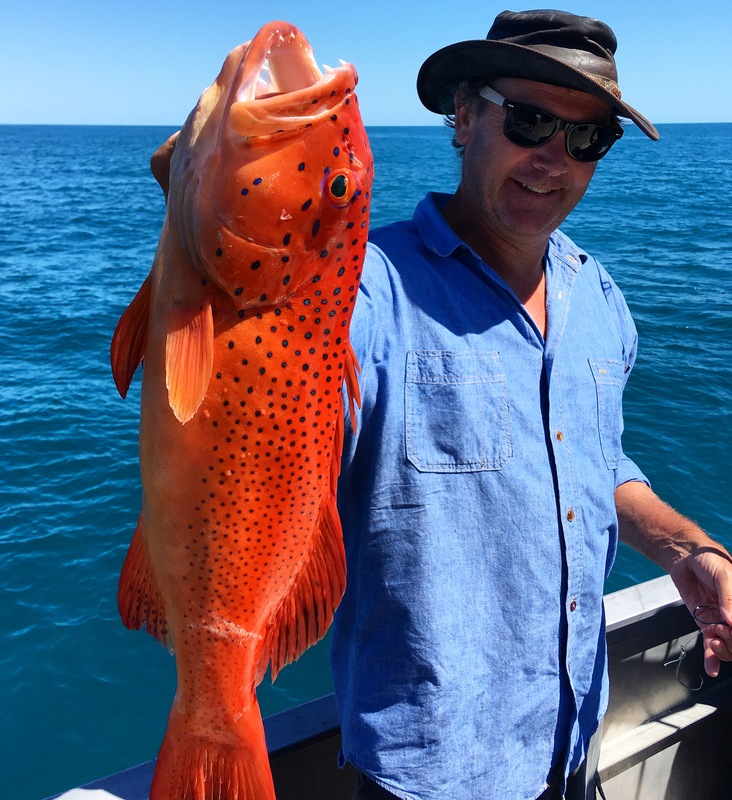 On our Broome fishing charters, we catch a lot of Coral Trout at the start of the season (April, May and June) on the shallower reefs. Later in the year we catch them in the deeper waters off Broome from 40 to 60m. Although this is just an observation, they can really be caught anywhere anytime…. You just have you be lucky. 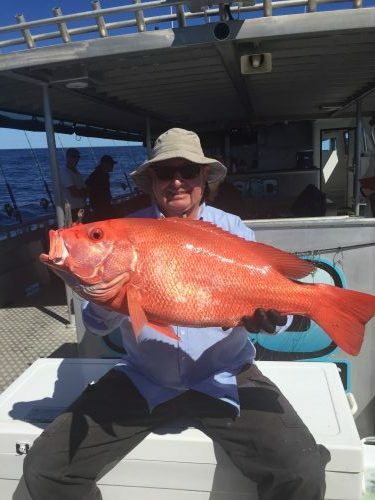 When fishing in Broome for Coral Trout you can create your own luck though, by using the correct bait and techniques. We catch lots of smaller Coral Trout on small soft plastic lures. We cast out of the lee side of the boat, let the plastic sink down to the bottom then twitch it back to the boat, keeping it nice and close to the bottom. When the boat drifts over the lure bring it up and cast again. 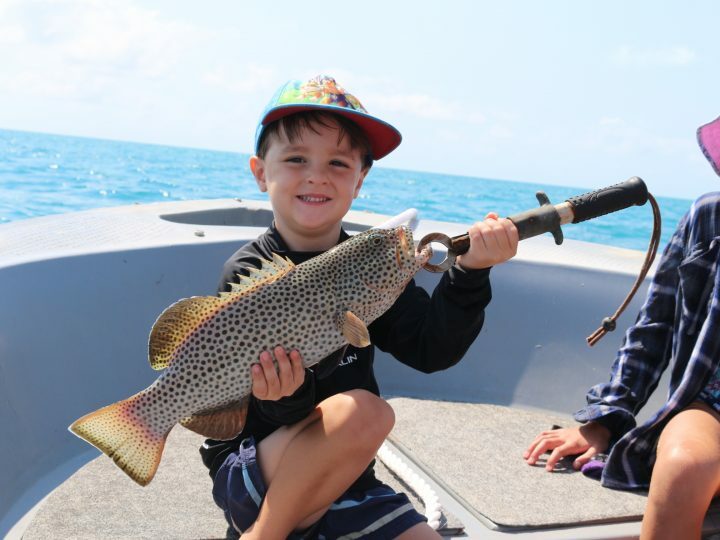 You can also catch the bigger Coral trout with this method too…. The bigger curly tails seem to work quite well and the colours don’t matter too much. Knife jigs are also a good option if you want to target trout, the fluttering jig imitates an injured baitfish and the Coral Trout cannot resist. On our Broome fishing charter we are quite successful at using this technique and the best way we have found is to fish the knife jigs like a soft plastic. Casting out on the lee side and working it back to the drifting boat. A smaller delicate action keeping the lure closer to the bottom seems to work better than the aggressive jigging that catches the larger pelagic’s. Everyone has their favourite bait for Coral Trout and nobody is wrong, I’ve seen them caught on the scrappiest bit of leftover fish skin you could find. This proves if they are hungry they are not fussy. My all-time favourite would have to be the whole sly,sly (or yellowtail) about the size of your palm, hooked through the eye or pinned through the nose then fished on a running sinker. As the tide pulls it along it gives it the look of a stricken baitfish and the Trout cannot resist! Second to that would have to be a strip of Stripey sea Perch filleted so there is part of the tail still attached to the skin. We don’t catch too many Coral Trout on hard body lures when fishing in Broome. Last year when we visited the Rowley Shoals this was the go to method and when fishing red head lures around 10 to 15 cm the Trout were literally like flies. Our kids had a ball holding the rods while we trolled through the shallows and seeing the fish come out from the coral reef to attack the lures. The Coral Trout are a protected species out at the Shoals and its all catch and release. When diving out there is not uncommon to see 1m long trout cruising the reef edge looking for its next meal. When we finished our Broome fishing charters last year, we travelled south through the Montebello islands. This is another place where the Coral Trout are abundant. We had the most success spearfishing for them along the fringing reefs. A highlight of the trip was catching 2 Coral Trout on 1 hard body lure. Amazing to see and awesome experience for the angler. One of the best things about catching Coral trout, is eating it! It’s such a delicious white fleshed fish you don’t have to do much to it. My favourite way to cook Coral Trout is some coconut oil on a hot pan, fish fillet with skin off, skin side down until it’s almost cooked through then a quick flip to finish it off. If you get it right the fish will be just opaque in the middle and tender and juicy with a crisp edge. Serve with sautéed Asian greens with soy and sesame oil, rice and a generous amount of chilli. Probably my all-time favourite meal!! 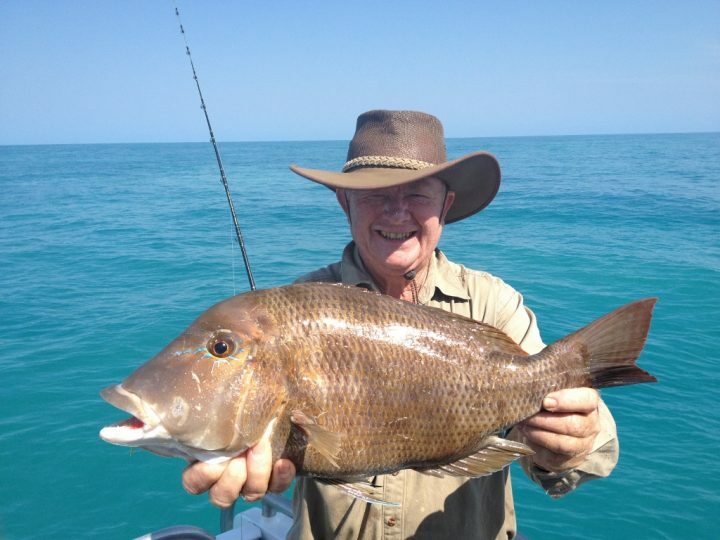 Of course, washed down with a cold beer after a hard day on our Broome fishing charters. 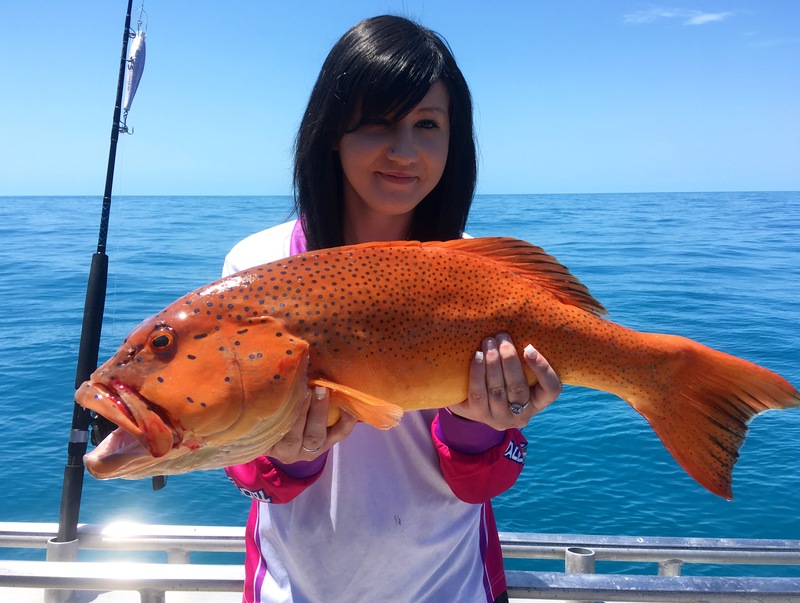 When are you coming to catch a Coral Trout?